Sergeant Gerry Boyle, a salty village cop in Ireland, has a subversive sense of humor, a caustic wit, and an uncanny knack for keeping people at arm's length. When a straitlaced FBI agent chasing an international drug-smuggling ring hits town, Boyle has no intention of letting the arrival disrupt his routine of hookers and wisecracks. Initially, he relishes offending and ridiculing the agent, but a murder and a series of peculiar events draw the reluctant sergeant into the investigation. 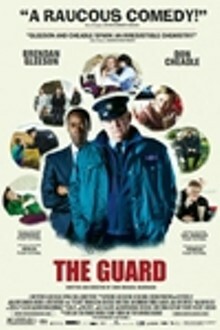 The Guard is not showing in any theaters in the area.